Get the pinnacle of gaming performance with the CYBERPOWERPC Gamer Supreme series of gaming computers. 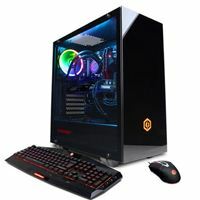 This Gamer Supreme series features monstrous processing power from AMD's version of their Ryzen 7 processors combined with the latest and greatest NVIDIA graphics cards to handle even the most demanding games on the market. An immense RAM allows you to easily tackle system-intensive applications such as video editing, and ensures a lag-free multitasking experience. A lightning-fast SSD boot drive provides quick load times for your most used games and applications. The Gamer Supreme series looks as stunning as it performs, as all these high-end components are packaged in a striking, sleek chassis.